There was a time, back in my earlier collecting days, when I would justify whatever purchase I was making by saying to myself, "At least I don't collect Hot Toys." 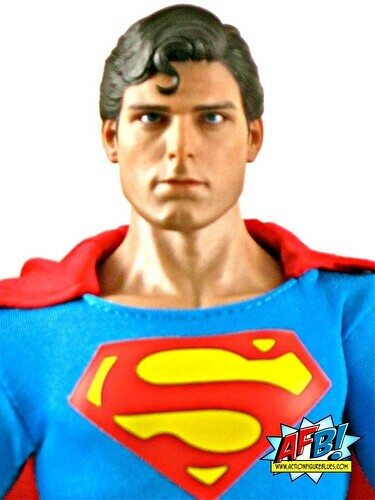 That resolve was already breaking by the time the Hot Toys Christopher Reeve as Superman figure came along, but this figure is one that has certainly pushed me over the brink of calling myself a Hot Toys Collector. 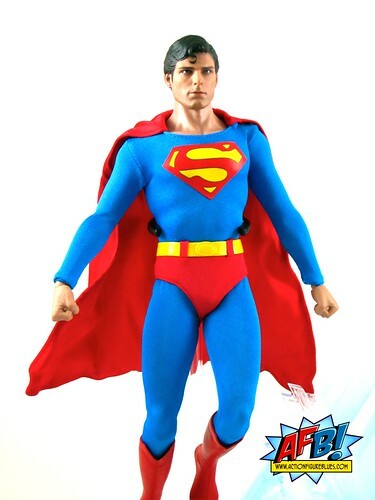 I have always veered away from movie figures, but for people of my generation, I think Chris Reeve as Superman is such an icon that it falls into a different category. The kicker for me in terms of deciding to purchase this, though, was the dead-on likeness of Reeve that Hot Toys has captured. It’s certainly not a surprise coming from Hot Toys, but this has to be one of their best. Throw in a Fortress of Solitude Base, and I was a goner! Once I decided to pull the trigger, the best deal around was from Popcultcha.com, who did a great job as always of sending off my figure once it was in stock. One thing I've resolved to do with each Hot Toys purchase is to take a set of unboxing photos, mainly to make re-packing the figure and it's many accessories and props an easier task. In this instance, however, doing the packaging photography was almost as much of a treat as photographing the figure itself. I’ve never considered packaging as a category in the very unoffical AFB Toys of the Year Award, but after opening up this lovely box I’ll have to remember to give this a nod at the end of the year. 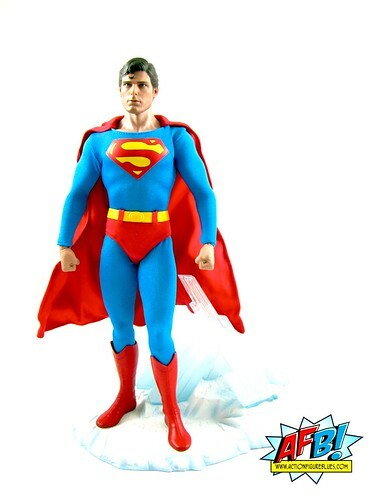 This figure is packaged with the utmost of love, starting with the Superman “S” shield shaped outerbox, moving to the dedication to Reeve on the next layer, and working down to the figure itself. It’s a majestic presentation which suits such a significant figure. The extra layer of plastic keeping all of the smaller pieces in the tray is a great touch. As for the figure itself, it has the things that we know we can rely on from Hot Toys - a fantastic True Type body which makes the figure imminently poseable. I recently divested myself of my DC Direct 13” figure collection, and when I look at this figure, I can really see why that slightly larger scale didn’t work as well. There’s obviously been a great deal of work put in to make the True Types, well, true, and it shows. 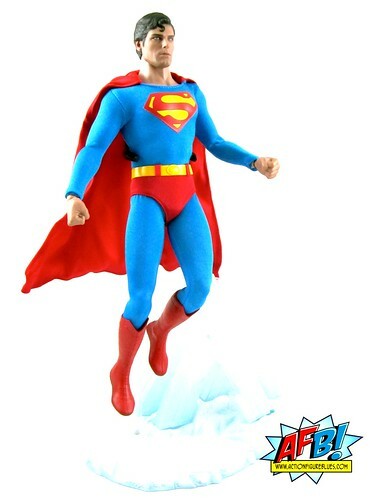 Superman looks great both in standing and flying poses, and there are many options for each. The figure comes with three sets of hands - fists, open hands, and hands with fingers extended in what I’d say is a great position for flying poses. Those Hot Toys folks really do think of everything. I don’t see myself making much use of the “in between” set, but the fists and the flying hands are going to come in very - well, you know. Superman’s outfit is beautifully constructed. The suit fits well and accommodates all manner of poses easily. Seams are tight and clean, and the construction of the boots is fantastic. One thing that really killed the DCD 13” figures for me was the very visible thigh and arm cuts that came through outfits like these, but there are no such issues with Hot Toys - in fact the form fitting nature of this outfit shows off the great design of the base body - the detail of the muscles and ribs on the torso are particularly impressive. If I was going to nitpick anything, it would be the cape. It’s lacking a little bit of weight that would have given it more presence. It does have a bit of framework to it to keep it from just hanging limp, but it might have been reasonable to expect something a bit more substantial for the price point. A little more weight in the bottom of the cape would have given it a bit of a better look. There is “some assembly required” for the Fortress of Solitude base, and while it does come with instructions I have to say I did have to fiddle around a bit to get everything in the right place, and even then not all of the ice poles sit as snugly and firmly as I’d like. For a low-budget base and prop, however, this is a great addition and provides some great display options. 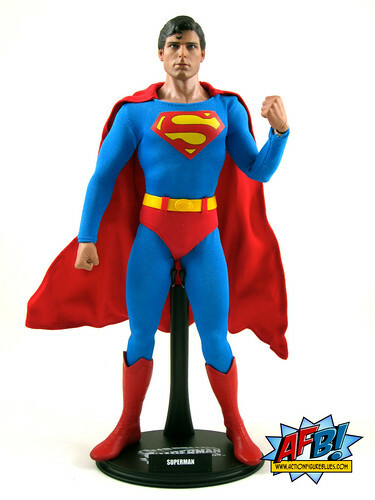 Superman can stand on the base itself or be displayed on a flight stand alongside it. All up - this goes right to the head of the class. It’s a loving tribute to a classic chapter of superhero film history, and one that I suspect has caused many collectors to cross over to Hot Toys territory. Perhaps, like myself, some will stay. 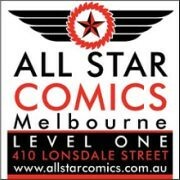 Also, please don’t forget to check out the brand new AFB Podcast- Episode One is up at iTunes now! Just a amazing looking figure. I wish i could afford to buy a few Hot Toy figures. Just a stunning figure. Congrats to the Hot Toys gang. Well done Andy! how's the neck articulation? can you get a full lying-down flying pose happening?